Young children can be really rough on toys, so having a toy that is durable is one of many important factors when deciding on toys for kids. Other important things to take into consideration are how fun it is, and if a child can use his or her imagination with it. Imaginext is a great line of toys by Fisher Price that are not only wonderful with building a child’s imagination, but are also durable and fun. Fisher Price first introduced the Imaginext line of toys in 2002. Like the name sounds, these are toys that encourage creative play. They first introduced the medieval line, which quickly expanded and each year since a new “world” has been introduced to the line. Some of the worlds that are now available in the Imaginext line include Super Friends, Dinosaurs, Disney Pixar Cars and Toy Story, Castle, and so much more. Within each world are several pieces, which is great for adding on to the set for holidays and birthdays. 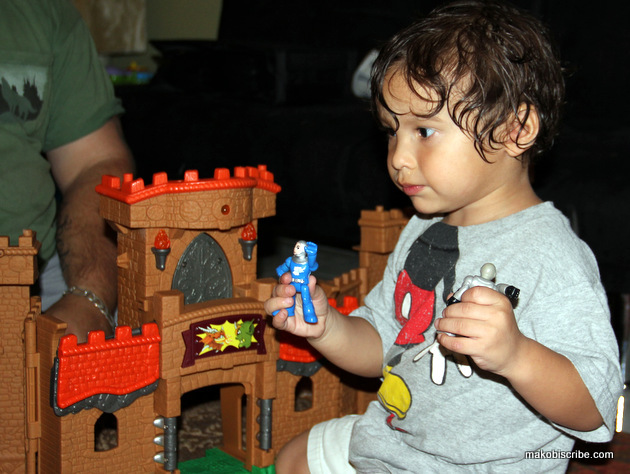 The Imaginext Eagle Talon Castle is one of their most popular worlds. It is a large castle that opens up into a world of fun for kids since it recognizes and responds to different accessories. Kids can have a battle with outside forces trying to take over the castle with discs that can be activated into defense mode! There are talons that lock the gate, shutters that barricade the windows and the eagle’s head is revealed & ready to fire at the enemy! It is a world of medieval fun for kid’s ages 3 to 8 years of age. You can see how much my kids like it in the video below. The sound effects are so fun, they play with it all day and return to it the next morning. We have not even moved it out of the living room yet. There are add-on items for this world, one of which is the Castle Dragon. 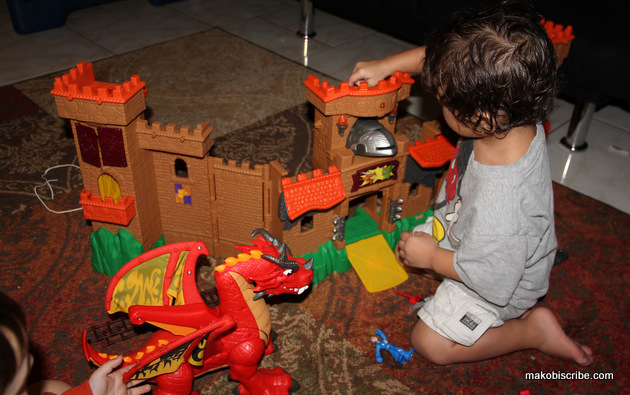 That dragon only heightens the fun of the castle since the dragon can roar by the control of a child and its wings expand automatically when lifted up off the ground. These Imaginext pieces make a great Christmas gift for your son, nephew, grandson or friend. You can find the Imaginext Eagle Talon Castle online and at most major retailers for about $50.00. 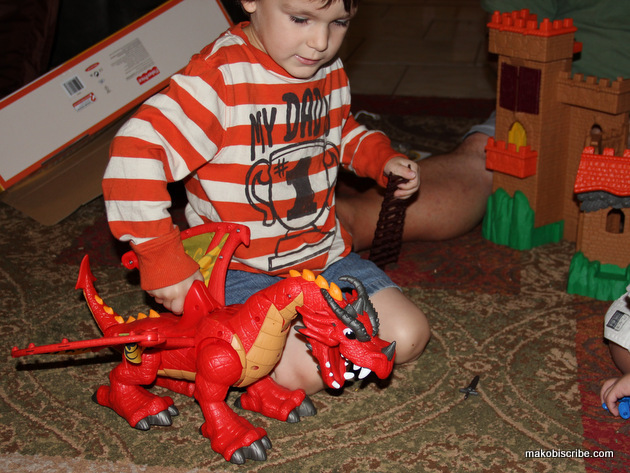 The Castle Dragon can also be found online and at most major retailers for about $35.00. One reader will win a Imaginext Eagle Talon Castle valued at $50. My 4 year old son wants this toy so bad!! Santa couldn’t bring it for him so he’s been tying to save up his money to get it. You have a lot of nice giveaways! I wish you used Rafflecopter! What a great toy, my daughters would have a blast playing with that. They pretend a dragon comes and get the princess all the time, now time to change it up for sure. well since it wasnt the end of the world, my grandkids would love this!! loving this! I have grandsons who would love this! I would give it to my grandson. He would so love it. Thanks for the opportunity! Things are a bit tight this year and my son would be thrilled to get something like this!! i know my grand daughter would love this. dragons aren’t just for boys! OMG, I think my daughter would love this, lol… she’s like her mom! Loves dragons, I get tattoos she gets toys haha.. Super awesome toy Thanks for sharing.